FastTracker II will now run on Windows and Mac (and should run on Linux). The clone project started last year, but it seems to have picked up pace – a new set of binaries are out this week, and MIDI input support was added this month. 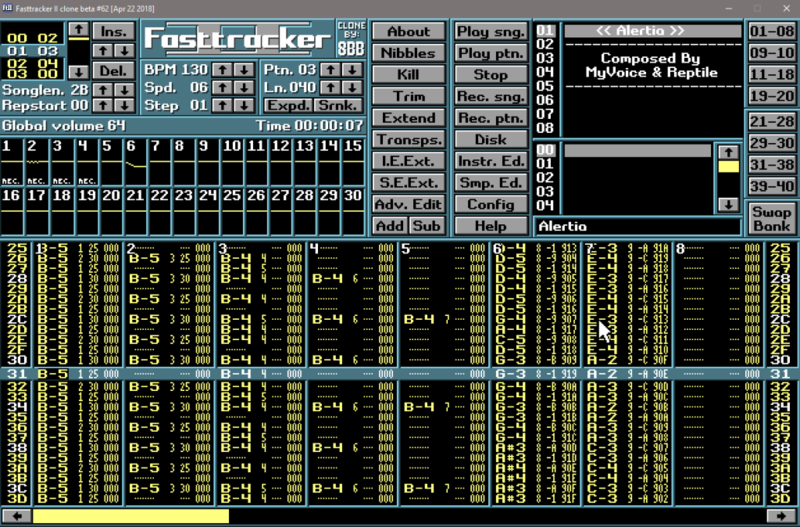 FastTracker II is a singular piece of software that helped define trackers, demoscene, and the music produced with it. If you’ve used it, I don’t really have to say more. If you haven’t, but you’ve used other trackers – even up to modern takes on the genre like Renoise – you’ve used software influenced by its design. Like all trackers, the fundamental use of the tool is as a sequencer. But unlike other sequencer concepts – piano rolls which represent time visually like pianolas and music boxes do, multitrack recorders and DAWs modeled on mixers and tape, or notation views – the tracker is a natively computer-oriented tool. Its paradigm is simply about a vertical grid, with shortcuts for entry (represented as numerals) via the computer interface. That makes trackers uncommonly quick via the computer interface. In the case of FastTracker II, you program every note and timbral change via mouse or keyboard shortcut, and it’s represented compactly in characters onscreen. FT2’s doubling up of mouse and keyboard shortcuts also makes it quick to learn and still quicker to use once you’ve mastered it. In fact, firing up this build (in 64-bit on Windows 10, no less), I’m struck by how friendly and immediate it is. It’s not a bad introduction to the genre. MIDI in is great, too, though MIDI out will “never” happen (in a message from the 13th of April). On Windows (and since it’s SDL-based, should run without a hitch on Linux/WINE), there’s also zTracker. That has some appeal as it’s MIDI-based, so could be a nice tool with hardware. Thanks to Nicolas Bougaïeff for this one, fresh off his Berghain debut. I want some new chip music from you, man. And it’s … like the 90s are alive.